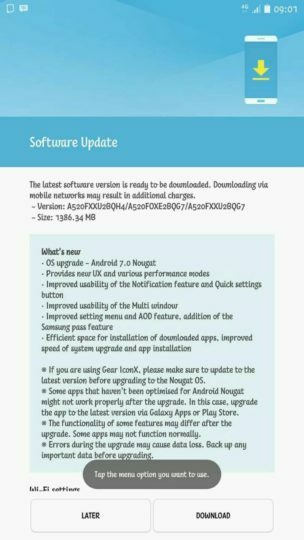 Following the Galaxy A7 (2017), the Nougat update has now reached the Galaxy A5 (2017), with the update kicking off in the Russian market. Nougat is now rolling out to all three 2017 Galaxy A models, although it will still be a while before it hits all markets where the devices were officially launched. The Galaxy A5 (2017) Nougat update brings almost the same set of features and improvements as the update for the A3 and A7, although the new Dual Messenger feature isn’t listed in the changelog for the A5, suggesting it could be market dependent (or it’s there but not mentioned, unless Samsung has forgotten to implement it on every device). You’ll see a newer user interface after the update, a slightly different version of Multi Window mode (which now takes after the stock Android implementation), enhanced notifications, Samsung Pass, and improved Always On Display functionality. To see if the Nougat update is available for you, go into the settings menu, followed by Software update, then hit the Download updates manually button. Being a major OS upgrade, the download size will cross 1GB, so it’s recommended to use a Wi-Fi connection for a quicker download and for saving on data costs. If your Galaxy A5 has received the update, do let us know in the comments section! May be that’s why it’s never going to be available for me. The nougat update for Samsung galaxy a5 (2017) is out now in Indonesia!! Is Samsung ignoring the Southeast Asian region because we’ve been waiting for about a month already and they’re only focusing on the European region. South Africa [Vodacom] when is nougat update? When is update nougat of galaxy a5 (2017) available in Viet Nam? I’m waiting so long. Is this the way Sam takes care of their customers? A-5 7 android 7.0 india update???? Hi, can anyone confirm if the A5 2017 DUOS (SM-A520F / DS) supports VoLTE and VoWiFi and what is the area for this phone? CSC code? We don’t know your CSC code. You need to check it. So, the problem is resolved, the seller has loaded me a firmware CZ that supports VoLTE for all Czech operators. build number iran is A520FXXU2BQH1!!! Hope you receive it too? Your phone is definitely not the Middle East series!!! There is no reason to lie my friend? Where do you live in Iran?